If you haven't read the other parts of this story, begin here at Part One and continue here at Part Two. That's Annie Toon nee Cook seated at the front, Fred the eldest at the back with the moustache. 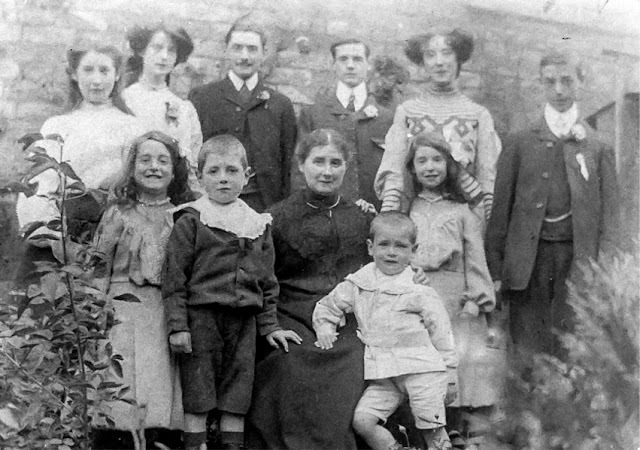 I think the back row is Mary, Maggie, Fred, Horace, Alice, Walter and at the front, Olive, Alfred, great-grandmother Annie, Albert and Lucy. Though I might have mixed up Olive and Lucy, and possibly Maggie and Alice. The photo was taken on the day of Frederick's wedding to Sarah Elizabeth Riley of Queniborough, Leicestershire, on 6th June, 1907. I first saw this photo several years back, shared by one of the Toon cousins but I had no clue who everyone was... recently another cousin shared it again and told me, that's Annie and all her children! Thank you! William, Fred's father, Annie's husband? He is not in the picture. He's not in the picture, because he died on 27th January, 1900, aged 39, leaving Annie a thirty-eight-year-old widow with ten children to raise, not one of whom was of full age, and a Painter and Decorator's business to run. In the 1901 census, great-grandmother Annie is listed as a Painter of Houses; son Fred, aged 19, is a "worker". Alice is 18 and a waitress in a cafe; Horace is an apprentice tailor. Maggie, aged 14, is an upholsterer's apprentice. They were not just working to make money; every one of them was learning a trade. The other children, aged 12, 8, 5, 2 and just one year old, were all either at school, or at home. I think we are safe in assuming that Annie Toon nee Cook had a lot on her plate. And yet... look at the photo above. A few years later, and all the children are growing up healthy and well cared-for, with natural, happy faces for this photo. I think she did a very, very good job. But what happened to great-grandad William, to cause him to die so young? That's where the poison comes in. Wait for the next part of the story to find out more!